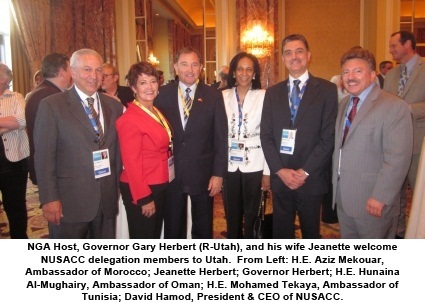 A delegation of Arab ambassadors, organized by the National U.S.-Arab Chamber of Commerce (NUSACC), has just concluded a high-level visit to the annual meeting of the National Governors Association (NGA) in Salt Lake City, Utah. The delegation consisted of Morocco’s Ambassador to the United States, H.E. Aziz Mekouar, Oman’s Ambassador to the United States, H.E. 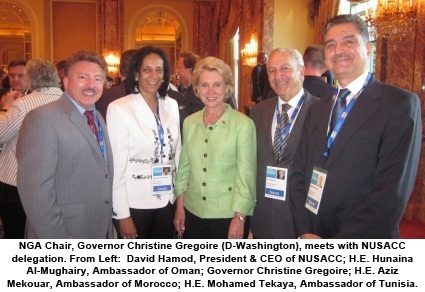 Hunaina Al-Mughairy, and Tunisia’s Ambassador to the United States, H.E. Mohamed Salah Tekaya. ​Apparently validating this point, the National Governors Association, for the first time, held a plenary session dedicated to the importance of exports and foreign direct investment. “In the global marketplace, and up against global competition, the nation’s Governors are leading the way,” stated the Honorable Gary Herbert, Governor of Utah. To underscore this point, Governor Herbert announced that Fortunemagazine has just listed Salt Lake City as one of the world’s 15 “hottest” cities for business. 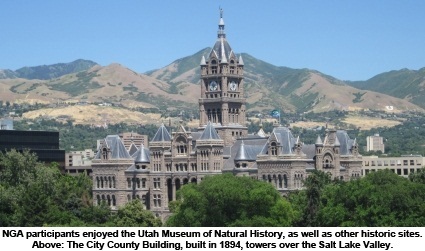 Utah’s capital was one of only two U.S. cities cited, the other being Austin, Texas. In addition to low tax rates and low-cost utilities, said Governor Herbert, Fortune focused on the many start-up companies emerging from the University of Utah. According to annual rankings of start-ups issued by the Association of University Technology Managers, the Utah-based university is neck and neck with the Massachusetts Institute of Technology (MIT), which has a research enterprise four times larger than that of the University of Utah. The Honorable Bev Perdue, Governor of North Carolina and Chair of the session on exports and investment, noted that “there is no more pressing a topic” than international competitiveness because it translates directly into U.S. jobs. North Carolina has 3,600 international firms and manufacturing facilities from 39 nations, she said, responsible for generating $9 billion in investment and 40,000 North Carolina jobs in the past 10 years -- representing 15 percent of the state’s total investment and job creation. ​The delegation of Arab ambassadors received a special welcome and introduction at the outset of this session on global trade. The three ambassadors attended as official “observers” and participated in a number of NGA working sessions in that capacity. Through NUSACC, they also met with a wide range of business leaders. The Sultanate of Oman was the first Arab Gulf nation to sign a bilateral accord with the fledgling United States, the 1790 Treaty of Commerce and Amity. Commercial relations have been close ever since. Oman signed a Free Trade Agreement with the United States in 2006, and the Sultanate is on track to receive more than $3 billion annually in U.S. goods and services by the year 2013, according to recent research by the U.S.-Arab Chamber. ​The Tunisian people’s revolution in January 2011 lit the spark of reform that has led to sweeping change throughout the Arab world. In an effort to support entrepreneurs and job creation in Tunisia, members of the U.S. Senate have introduced S.618 on a bipartisan basis, which mirrors a companion bill in the U.S. House of Representatives (H.R.2237). If enacted into law, the bill would create a Tunisian-American Enterprise Fund to provide between $10 to $20 million of capital to new businesses in Tunisia. Tunisia “looks forward to attracting American investment, promoting trade and business opportunities, and establishing mutually beneficial partnerships with the United States,” noted Ambassador Tekaya in Salt Lake City. “The new Tunisia will strengthen good governance and transparency and will be an attractive place for business,” he concluded. Morocco’s commercial relations with the United States go back more than 230 years. According to the Office of the U.S. Trade Representative (USTR), Morocco was the “very first nation to recognize the sovereignty of a newly independent United States,” in 1777. “The Treaty of Peace and Friendship between the U.S. and Morocco, negotiated in 1787, is the longest unbroken treaty relationship in U.S. history,” says USTR. Morocco signed a Free Trade Agreement (FTA) with the United States in 2004, marking the first such agreement in Africa. This is important for U.S. exporters, according to Ambassador Mekouar, because Morocco is well positioned to provide duty-free access to 1.2 billion customers in Europe, Africa, and Asia. Morocco is on track to attract 20 million tourists by 2020, noted the ambassador, and the Kingdom’s Tanger-Med port is on its way to becoming the largest of its kind in Africa and the Mediterranean. According to research conducted by the National U.S.-Arab Chamber of Commerce, Morocco is expected to import approximately $3 billion in U.S. goods by the year 2013. 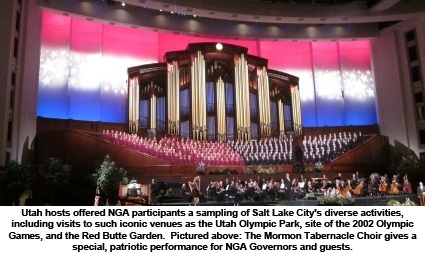 The National Governors Association (NGA), founded in 1908, is the collective bipartisan voice of the nation’s Governors and one of Washington DC’s most respected public policy organizations. The annual meeting of the NGA brings Governors together to share best practices and address policy issues, and the gathering also presents opportunities for Governors to meet with government and private sector leaders from around the United States. 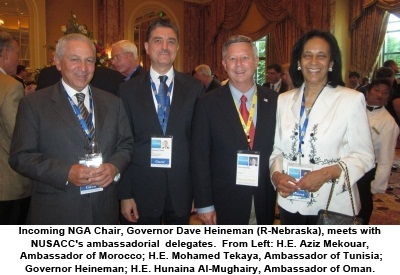 This is the fifth year in which the National U.S.-Arab Chamber of Commerce has been privileged to lead a delegation of Arab ambassadors to the NGA annual meeting. Previous destinations included Traverse City (Michigan), Philadelphia (Pennsylvania), Biloxi (Mississippi), and Boston (Massachusetts). This year’s trip was made possible by generous in-kind support from Lockheed Martin Corporation. Governor Dave Heineman of Nebraska, who was elected Chairman of the NGA for 2011-2012, highlighted the importance of entrepreneurship and how small businesses can become fast-growing firms that support economic growth statewide. ​In his initiative for the year, entitled “Growing State Economies,” Governor Heineman noted that successful businesses in all forms – startup firms, scalable enterprises and transformational corporations – depend on many factors, including innovative ideas, access to early stage financing, management capacity, strong networks and the right set of social and economic conditions. The key challenge for policymakers wishing to promote entrepreneurial activity and job growth, he suggested, is to find which factors are missing and determine how they can be supplied.